Without any warning, in September 1999, David Newman was told he had a rare and life-threatening tumor in the base of his skull. In the compressed space of five weeks, he consulted with leading physicians and surgeons at four major medical centers. The doctors offered drastically differing opinions; several pronounced the tumor inoperable and voiced skepticism about the effectiveness of any nonsurgical treatment. Talking with Doctors is the story of Newman's efforts, at a time of great stress and even impending death, to wend his way through the dense thicket of medical consultations in search of a physician and a treatment that offered the possibility of survival. It is the story, especially, of the harrowing process of assessing conflicting "expert" opinions and, in so doing, of making sense of the priorities, personalities, and vulnerabilities of different doctors. All too often, he found, the leading specialists to whom he was sent were strangers in the consulting room-and strangers who became stranger still, both cognitively and emotionally, when ambiguous findings pushed them to the outer limits of their training and experience. Newman writes poignantly of his sense of powerlessness and desperation, of the painstaking means by which he ascertained what could be known about his tumor, and of the fortuitous events that finally led him to life-saving help. Talking with Doctors is a compelling, absorbing, unsettling story that touches a collective raw nerve about the experience of doctors and medical care when life-threatening illness leads us to subspecialists at major medical centers. 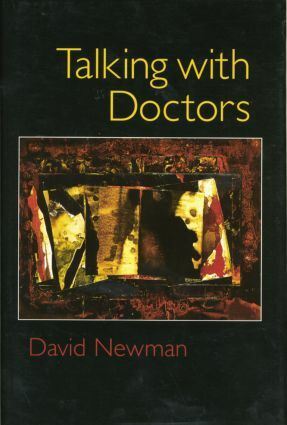 Probing the nature of medical authority and the grounds of a trusting doctor-patient relationship, Newman illuminates with grace and power what it now means for a patient to participate in life-and-death medical decisions. "Talking With Doctors attests to the terrific burdens placed on seriously ill patients in a technology-driven system that fractionates care among different specialists. Mr. Newman, a thoughtful, reflective psychotherapist, proved adequate to the burden of evaluating his doctors and their disparate recommendations. Reading his cautionary story will be preventive medicine for the public and should be included in the continuing education of every physician." "By reading this clearly written and highly accessible work, patients will learn what they have a right to ask of their doctors; conversely, doctors, especially highly trained specialists and subspecialists, will be reminded that patients deserve and need to be viewed as complete individuals deserving of explanations rather than as a composite of test results." "For people reading the text without the benefit of working in health care, the lessons are clear: They should beware of accepting information too soon or too late because plenty of middle ground exists. For healthcare providers, especially those working in cancer care, we recognize the author's experience and acknowledge that, in all of us, pieces of the personalities described exist. From that, we can be reminded to avoid falling into the safety nets of medical vocabulary and abbreviations when speaking with patients and family members to keep a 'professional' distance. Furthermore, the book gives us an excellent opportunity to ask ourselves why we got into health care and oncology care." "Narrative is the right structure for Newman's purpose. As he pulls together memories and notes to make meaning of his experience, his readers accompany him on his quest and understand why he chose as he did. Narrative subcurrents of his practice of psychotherapy and art (he is a painter) flow through the story and are interesting in themselves, particularly the idea of the effects of his illness on the relationship he has with his patients. But it is the talking with doctors that is central to the book. Talking with Doctors is very readable, and addresses a persistent and universal human experience. It can take its place among other illness narratives and will be useful as a text in medical humanities courses. "This book is beautifully written; it can be appreciated by a lay audience and perhaps even an undergraduate class or a beginning medical student class. It has short, concise, easy-to-read chapters, and it demonstrates the importance of support from family, friends, colleagues, and even therapists when one if faced with a major, life-threatening illness or even routine care. It is a welcomed addition to the popular literature on doctor-patient communication." Talking with Doctors. Please Give Him Back His Copay. The Worst-Case Scenario. Forewarned, Four-Armed. Chatter in the Infield. No Dye. Eve's Offering. Three Words He's Not Afraid to Say. Whose Pathology Is It? An Orderly Inquiry. The Putting Out of Eyes. Traffic. No Dye, Again. Unwritten Letters. Parallel Parking. Something is Wrong with You. Is That Your Tumor Talking? Higher Court Ruling. Two Very Different Kinds of People. Nothing Palliative. A Shadow of Opportunity. Contradiction. Stuffed Animal. New York, New York. Hopes and Prayers. He Can Do Things No One Else Can. Perseverance and Serendipity. On a First-Name Basis. Help! I Need Somebody. Not Just Anybody. He Will Operate on Anyone Who Lets Him. What You Don't Want. What I Deserve. Now These Days Are Gone, I'm Not So Self-Assured. These Little Town Blues. Saying Good-Bye. Street Fight. These Vagabond Shoes. Start Spreading the News. Return of the Stuffed Animal. In Human Hands. Life Without Parole. False Bottom. Coming and Going Before the Graveyard. Life-and-Death Dialogues.